Cupcakes for an Amazing Friend! Great and true friends are a treasure to be cherished and Michelle is one of those friends. In fact I don’t think that her special day on Thursday was long enough to receive all her beautiful birthday messages and calls and also celebrate and open wonderful presents. Of course Michelle took it all in her stride and certainly celebrated aging another year with grace and style. When I first spotted these burgundy and green Wilton’s cupcake holders in Kadies, Fourways I knew immediately they were perfect for Michelle’s birthday cupcakes. I made creamy blueberry, vanilla cupcakes with a vanilla cream cheese icing in green cupcake holders. I popped them into the beautiful Wilton’s holders once they were baked as this preserves the beautiful colouring of the holders. 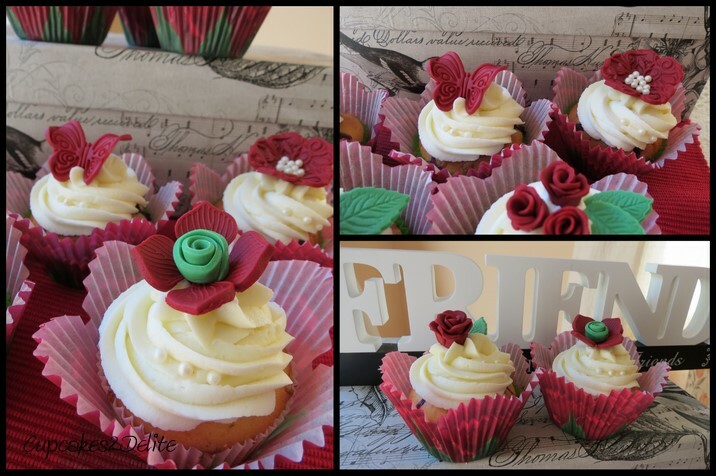 Not resisting my instinctual urge to match colours, I made burgundy sugar paste roses, miniature roses and embossed flowers to decorate the cupcakes. I photographed them above alongside the unusual gift box Michelle gave me for my birthday as well as the Friends plaque that Wendy gave me. I wondered at first if it is actually polite to say that “The best antiques are Old Friends” but I understand now that friends such as these are like antiques as they are precious, need to be elegantly shown off and talked about (only in the best way possible) and of course treasured for a lifetime! Cupcakes for a Treasured Friend! ← A Bit of Magic with these Tinkerbell Cupcakes! Thanks Michelle and delighted you loved your cupcakes and yes love doing anything involving colour and so don’t forget the scrapping too! 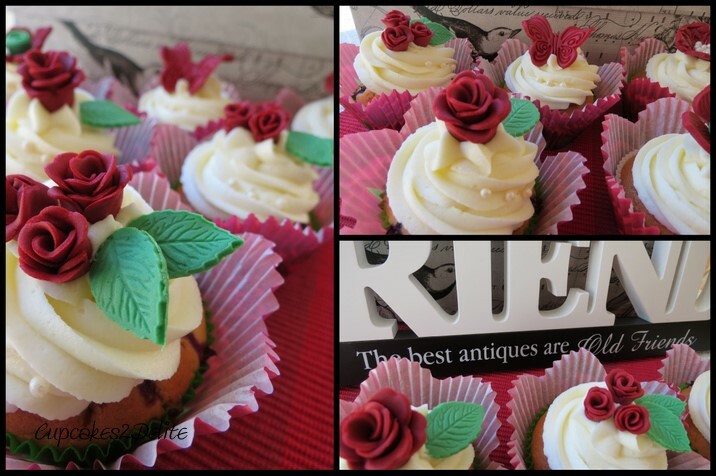 Gorgeous cupcakes once again dear … lovely to see the ‘old’ friends in use ….. 🙂 And no it isn’t because we are old – it is because we are special like antiques. I am glad you said special like antiques and not just ‘special’!